Fashion With A Conscience has moved. Visit www.fashionwithaconscience.org: OMG moment - Rumor BUSTED!!! 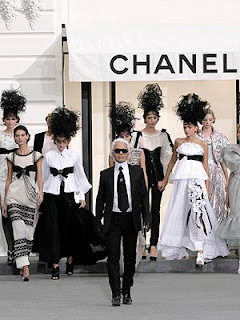 "After Diane Pernet reported on her blog A Shaded View on Fashion that Karl Lagerfeld supposedly didn't renew his contract with Chanel, we inquired about the rumor's veracity directly with the label. A spokeswoman responded with an emphatic "No!" So there you have it. Update: A spokesperson for Lanvin has also denied the rumor that Alber Elbaz will replace Karl at Chanel."